When A. D. Kenamond wrote his Prominent Men of Shepherdstown to celebrate the two hundredth anniversary of Shepherdstown in 1962, he might have made it Prominent Men and Women. 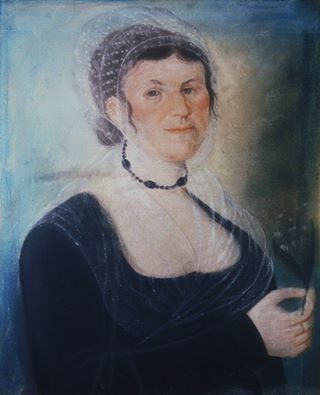 If the good dean had chosen to do so, he might have included Mary Catherine Weltzheimer (1765-1823). Mary Catherine and her husband Frederick operated the Weltzheimer Tavern on North Princess Street as early as 1795. When Frederick died in 1806, Mary Catherine continued to operate the establishment until her death seventeen years later. Evidence of her success as a businesswoman is that she accumulated substantial property. In her will she bequeathed to her children the house and grounds of the ordinary, another house with ten acres purchased from John Baker, a house and lot on Rocky Street, and her “upper house and lot” (Entler-Weltzheimer House?). She also owned several slaves and stock in the Boonesboro turnpike and the Shepherdstown and Winchester Turnpike. Another measure of her status as a woman of substance is that noted portrait painter Frederick Kimmelmyer painted her portrait in 1816. As late as 1930 the portrait was in the hands of Frederick Weltzheimer, a descendent; its current location is unknown. Photograph courtesy of the Museum of Early Southern Decorative Arts (MESDA). Operated the Weltzheimer Tavern with husband Frederick on North Princess Street as early as 1795. When Frederick died in 1806, Mary Catherine continued to operate the establishment until her death seventeen years later. Evidence of her success as a businesswoman is that she accumulated substantial property.